Villa with Private Pool and spa. A 2 storey 4 bedroom 3 1/2 bathroom home. There is a private pool and spa. Pool towels are provided. The house is located only 8 miles from Disney. There is a fully equipped kitchen with cooker, microwave, fridge/freezer and dishwasher and a utility room with washing machine, tumble dryer, iron and ironing board. A lounge is located at the front of the property. A family room is located at the back with TV and video/Blue Ray Player. Also a PlayStation 2. Cable TV and Internet. A games room with pool table, table football and air hockey is situated in the garage. There is a master bedroom, a queen bedroom and two twin rooms all with TVs. There are supermarkets and restaurants all on your doorstep. Please note that there is strictly no smoking in this home. Smoking is permitted outside by the pool. En-suite bathroom to bedroom 1 with bath, shower, wc and twin sinks. En-suite bathroom to bedroom 2 with shower, wc and sink. Bathroom 3 with shower over bath, bath, wc and twin sinks. WC with wash hand basin in cloakroom downstairs. There are two lounges. One with TV, Blue Ray player and Router. Cooker, microwave, fridge/freezer and dishwasher. There are numerous golf courses in the local area. Notes on accommodation: There is air-conditioning and heating in the property. There is a pool safety fence to make this property extremely safe for young children. Outside: There is a private pool and spa at the property. This can be heated with an extra charge. The heating is not usually required in the summer months. There is sunbeds and pool furniture provided. Utility Room: Washing machine, tumble dryer, iron and ironing board. Cleaning / Towels / Linen / Maid service: Bath towels, pool towels and linen are included in the price of your stay. Your rental includes a clean on departure, however, if you require a clean mid stay please organise this with our management company. Other: There is a games room located in the garage. This includes a pool table, air hockey and table football. Had everything my family needed. Was close to shops and all the parks. Great property, great location, great host. We've been coming to Orlando for the past 10+ years, each year renting a different home. Dealing with Sean was easy and he was super responsive. The neighbors take care of the place and they are super friendly and available. The house is spacious, clean, well stocked (towels, etc), and the location is fantastic for the golf courses we were playing. Overall, it was the best home we've rented to date and I will make sure to rent it next year. PERFECT FOR OUR DISNEY VACATION!! We all absolutely loved this place!! So bright and clean and beautiful!! Our only regret was that we didn't get to spend enough time here since we were at the Disney parks all day. But we used the pool and hot tub at midnight many nights - AWESOME! - and actually stayed "home" one day to just chill at the pool and hot tub during the day. The price was unbelievable to top it all off so trust me, the next time we plan a Disney vacation, THIS is where we want to stay!!! Thank you Sean for all your help!!! The house is big, the pool is greate, all the parks are close to drive. 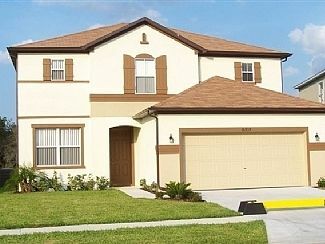 I would definitely come back to stay in this house in my next Orlando vacation!!! I'm really glad you had a good time ! Do hope you come back again. The house was beautiful and close to everything which made shopping and dining very convenient. Sean is great to work with. He responds to your needs very quickly and is always very pleasant. I would definitely recommend staying here while visiting Florida and I myself would stay here again. Thanks Sean for everything. The east and west coast of Florida is accessible easily by car within 1 hour. Orlando airport is approximately half an hour by car (depending on traffic). Sanford airport is approximately an hour by car (depending on traffic). All Disney parks can be reached within approximately 20 minutes. Universal, Universal Islands of Adventures, Seaworld, Discovery Cove and Aquatica can be reached within approximately 25-30 minutes. Busch Gardens in Tampa is around 1 hours drive away. Every amenity is easily accessible from this home. Supermarkets, post office, banks, restaurants and take aways are within walking distance. There is also a medical centre 5 minutes drive away. The full cost is required 50 days before arrival. If you make your booking within the 50 day period then the full cost is required. Pool heating is available at a cost of £15 per day although there is a minimum of 3 days. Usually this is not required during the summer months. Changeover Day: Changeover day is flexible. Departure time is 10am and arrival time is 4pm.